Dribbble is great, but that filled with contributions, you simply cannot stay on top of things. Many members make their designs and other resources available for free downloading, while most members don’t. Dribble in itself does not offer simple access to the many download resources the platform contains. So, if you are one of the seekers looking for ready-made designs or UI components, you will need to rely on third parties. Fortunately there are a few. Making use of the Dribbble API, Freebbble is one of these little helpers. 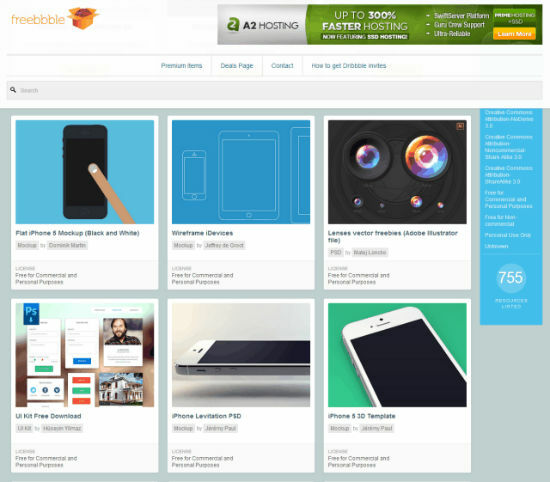 Hafiz Rahman from Indonesia created Freebbble as part of the Tokokoo Network, a WordPress theme provider I personally have never heard of before. Tokokoo claims to have a client base of over 35,000, which sure does sound impressive. Freebbble gives room for a number of premium offerings from the Tokokoo portfolio. From a business point of view, Freebbble is most likely designed as a marketing tool for Tokokoo, a sales aid. Be it as it might be, Freebbble is free and this is what counts. If you are interested in easily finding free Dribbble resources, Freebbble will do that job flawlessly and without urging you into buying anything. Designed as a mixture between a search engine and an editorial catalogue, Freebbble concentrates on providing an easy access to what Dribbble users offer as free downloads. To reach the individual resources you can use a free search term functionality or carious category-based shortcuts. At the moment 755 downloads can be filtered by topics such as Background, Icon, HTML/CSS, PSD, UI and others. Even more interesting is the possibility to filter by license. This makes it easy to filter all resources free for commercial use. Other licenses are available, too. It would be nice if we could further combine the different filters to eg. search for any UI element free for commercial use. This isn’t possible, yet. But, a portfolio of 755 downloads does not take too much of your time flipping through it without nested search features. It may have crossed your mind, while I was introducing you to the license filters and if it did, you are perfectly right: Freebbble can only tell licenses that are actually attached to a resource. A whole lot of Dribbblers, if not the majority does not take care of proper license information, though. Not attaching a license to their files doesn’t necessarily mean there is none. You may know this phenomenon from Github, too. In these cases you should get into contact with the individual creators and ask them explicitly if they allow your intended use case. Dribbblers are polite people. Chances are high, you won’t get disappointed. Most of the time proper licensing will turn out to just having been forgotten to mention. The filter “Free for commercial and personal purposes” still offers access to more than 160 resources. So let’s not lament too loudly. 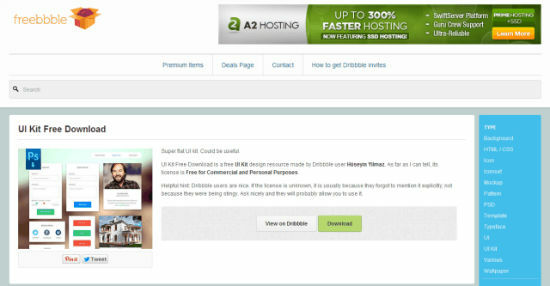 Freebbble resembles another service, we reviewed only a few weeks ago (link below). Not only in regard to its look and feel does Freebbble remind me of PSDDD, the number of curated resources is only very similar. There are a few notable differences, though. Freebbble allows to download the resources directly, whereas PSDDD always sends you to Dribbble. PSDDD has nothing like the license-based filters to offer.